This is no ordinary, run-of-the-mill ranch intrigue. No sir, this is a real, honest-to-goodness archaeological adventure! When an old friend of Slim’s starts an archaeological dig near the ranch, it doesn’t take long before little Alfred gets caught up in the excitement. And once Alfred manages to get himself invited to the dig, it isn’t long before Hank follows. Hank finds himself face-to-face with the most ancient of bones--a huge bison bone that Hank just knows has been aged to delicious perfection. 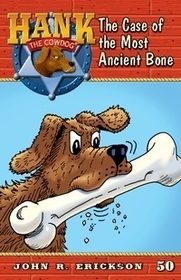 Hank should be protecting the bone, but can he keep his doggie instincts at bay and uphold his position? Will the most ancient of bones get the best of Hank?